I can’t believe it’s been so long since my last post! Aaaah! I’ve been so busy movin’ and groovin’ I’ve completely neglected to share all of my recent successes! Where do I start?? I’ve had several training sessions between my first hike and today and can feel myself getting stronger and stronger with each week. My muscles are adapting, my back is adapting (finally! ), and most importantly my brain is adapting to my newfound activity levels. I think a lot of this journey is mental. I’m so used to second guessing everything, worrying that “oh if I do that I’ll be wrapped in ice and popping pain pills in about an hour… better stay away!” While those thoughts may not be 100% out of my brain, they’re quickly disappearing. I have to say my favorite moment so far was my first softball game using the IDEO. I can’t really remember the last time I played and ran for myself without having extreme pain. And at one of my games I was somebody ELSE’s pinch runner!! How wild is that?! I’ve included 3 videos below: One fuzzy/grainy photo (oops sorry!) of me running around the bases and the others from my training session this morning working on my running form and gaining confidence with box jumps. It’s been really amazing to do things that I couldn’t even do at my peak before pain set in. This morning I went on my first hike since 2011. It was more of a mini-hike but walking on hills and trails even just for a couple miles was something I couldn’t even imagine doing without intense pain. I walked the beautiful trails of Discovery Park in Seattle, WA and ended up at this beach and lighthouse. My muscles are still very much adjusting to the IDEO so I can only imagine what I’ll be capable of when I get them back in shape! This weekend I will be playing my first softball game with the IDEO. I normally try to hit the ball far so I can slowly mosey on down to 1st base and have somebody run for me, but not anymore! I can’t remember the last time I touched home plate and am so excited to play at full speed and ability and make it all the way around the bases! Stay tuned! Walk a 9 hole golf course (3 1/2 years). Walk an 18 hole golf course (never been able to do this). Go on a hike. Easy (3 years), Medium (never), Hard (never). I’ll edit and add to this list as time goes on and I think of more things I’d like to do! So excited to cross items off this list! Yesterday I tested the plastic prototype of the IDEO. I normally walk slowly, with a limp, and would rather crawl on my hands and knees than walk on uneven gravel (shudder). Just with the plastic test version I was able to walk full speed on many surfaces for 30+ minutes without pain. I didn’t even have to go home and ice/elevate my leg until sun-up which would be the normal routine. This. Is. Amazing. It was an awkward feeling to try and re-teach my brain that I don’t have to baby that leg as I take each step. It’s going to take some time to retrain my body that’s for sure. In just 16 days (but who’s counting…) I’ll have the real carbon fiber device. I can only imagine the things I’ll be capable of then! Thanks again to everyone who has helped make this possible… I have no words for what I’m feeling right now! CLICK HERE TO WATCH A VIDEO CLIP OF ME WALKING! This is the start of my new life… my leg has been cast/molded to start the process of getting my IDEO made. No more having to say “no” to invites requiring me to walk/stand. I’m excited to hike, dance, and eventually run with my friends and so much more!! Tomorrow I will test a plastic prototype and am on my way to having the real carbon fiber device. I will carry a piece of everyone that has helped make this possible in every step I take with love and gratitude. Although I am not at 100% of funding I will take out a loan for whatever the leftover amount is. If you’re still interested in helping out please visit www.kramerfundraising.com. Please note the donation portion of the website will be shut down once my goal is reached or I have the device in my hands. I will also graciously accept hugs, high-fives, and words of encouragement as donations as those are equally important and meaningful to me. Thank you everyone for being part of this crazy journey with me! I was born in 1986 with a severe right club foot. My foot was turned down and inward because my tendons were shorter than those in a normal foot. My family had to hear the news along with the doctor’s prognosis that “she will never walk”. Although it is the most common foot deformity that a baby can be born with (1 in 1000 births), it is not well known outside of the clubfoot community and a specialist is required for proper treatment. Luckily, I come from a family that believes in second opinions and beating the odds. 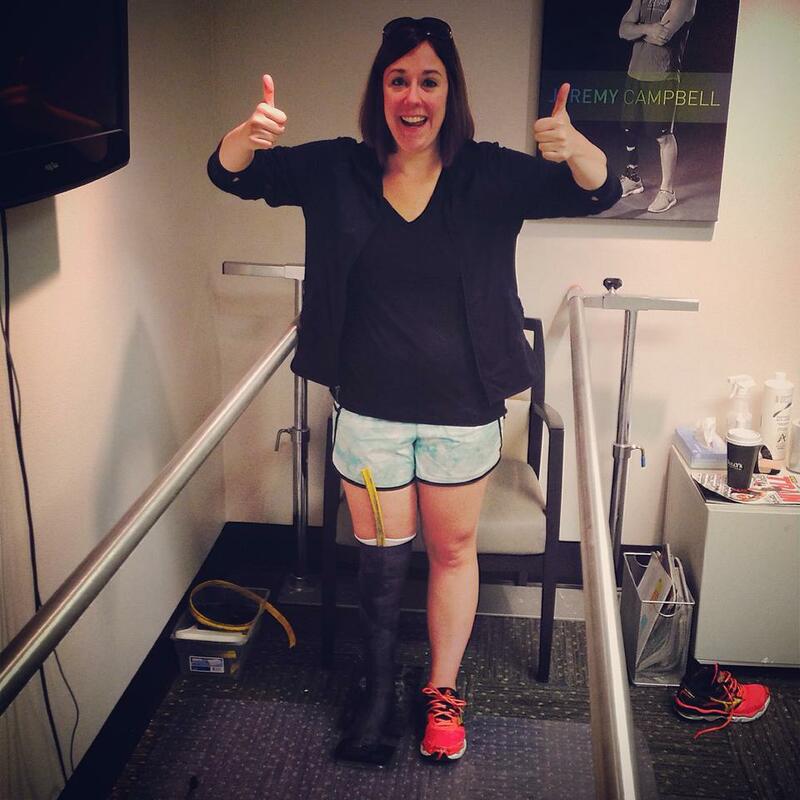 My treatment started with casts and boots… and it failed. My second surgeon, Dr. George Thompson at Rainbows Babies and Childrens Hospital in Cleveland, OH performed a successful reconstructive surgery on my foot at just 8 months old. My subtalar joint was fused and tendons were re-configured to straighten out my foot. Now that my foot was facing the correct direction, I forever lost the ability to point my foot or wiggle my toes. My big toe and second toe bones are disfigured and cause me to walk on the outside of my foot (shown in the xray image, below). Despite the odds, and with many thanks to my doctor’s approach for functionality not appearance, I had a fantastic childhood. I grew up playing every sport I could possibly try. I was always the girl trying to out-play everybody and was even a competitive dancer thanks to an instructor who gave me the chance to compete without judges docking points for my un-pointed foot (think Dance Moms, but without all the crazy). I was most successful in Softball, an all-conference Fastpitch player in high school and even considered playing in College (but chose a way-too-time-consuming major instead). I could fool anyone into thinking there was nothing different about me… as long as I had shoes on. My right foot and leg had developed noticeably smaller than my left side. At 14 years old I had to have surgery on my left knee to stunt the growth plates and allow my right leg to try and “catch up”. Before the surgery I had a 2+ inch difference in leg lengths and now only have a 1 inch difference causing much less strain on my lower back. I could stand longer and even run better now that my back/posture was improved. Although I was never a long distance runner, or the fastest runner, I grew to love it. I started running 1-3 miles a few days a week and ran my first 5K in college. It was only within the last 5 years that my birth defect started causing me pain. I was told growing up that I should expect pain, arthritis, and other problems later in life, but did not expect it so soon. In my 20s I first started to experience pain when on my feet for several hours at work. As I got older, I could spend less and less time on my feet before unbearable pain. I’m now down to less than an hour before I have to sit down. I haven’t gone for a run in over 2 years. More and more frequently, I’m having to cut activities out of my life that I love because the pain is just too much. Now the pain is persists even when I’m not active. Some mornings require a foot massage before even attempting to step on the ground, and other mornings I’m hopping around on my good leg and not even bothering to step on the clubfoot. The realization that I needed to find a solution came when I had to consider giving up the sport I love most: softball. I currently have somebody run for me when I hobble over to first base, but fear that I won’t be able to participate at all soon. I struggled to find a doctor in my adult years that could understand my condition, my love for an active lifestyle, and my stubbornness to not accept the “just don’t run or walk for exercise” response that I kept getting. I finally met with Dr. Stephen Benirschke in Seattle, WA who not only knew my childhood doctor, but went above and beyond to help me find a solution to allow me to run again. I got a custom insole, did some physical therapy and tried stretching techniques, but it just wasn’t enough. Finally, he and his colleague told me about a revolutionary device that until about 2 weeks earlier had only been available to military personnel. It was called “IDEO” and stood for “Intrepid Dynamic Exoskeletal Orthosis”. I watched a brief video about the device and knew this was it, I was about to get my life back. The Intrepid Dynamic Exoskeletal Orthosis (IDEO) was created by prosthetist Ryan Blanck in an effort to help injured military personnel avoid amputation after leg trauma. It is a cross between a prosthetic and an orthotic that, in summary, stores energy to deflect injury and minimize pain allowing users to walk, run, jump, etc. It was only recently made available to civilians. I met with Ryan Blanck in the Fall of 2013 and qualified as a candidate for the device. Unfortunately, my insurance denied any coverage. The custom-made carbon fiber device costs $9,000 out of pocket. 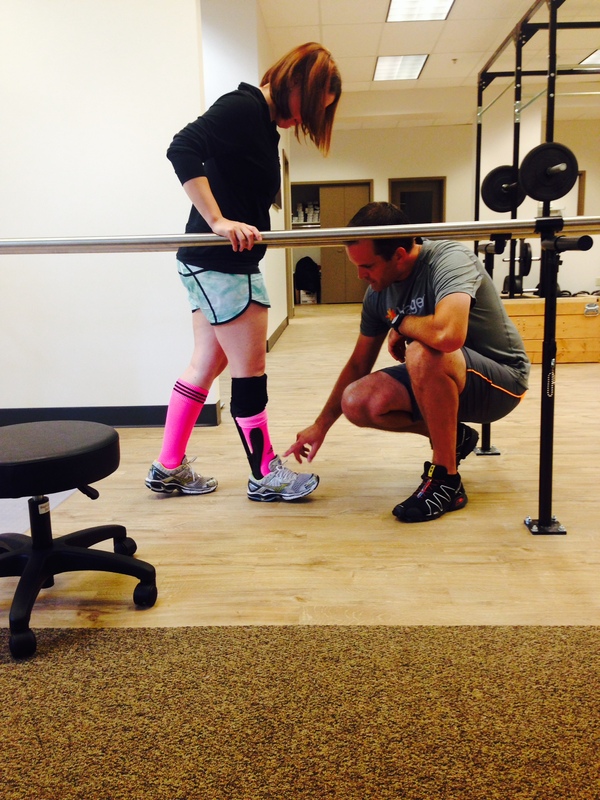 This includes leg casting, prototype testing, device cost, and device use training. After much consideration for such a large expense, I began my efforts to pay for the IDEO out of pocket in March 2014. There is no price tag on quality of life and I hoped to regain mine. By August 2014 I was well over 1/2 way to funding the device and have begun the process of getting it made. This blog will follow my journey as I begin my new adventures with my new leg from molding, to testing, to training, to LIVING!